Cryptocurrency exchange and custodian Gemini and crypto e-commerce pioneer Chimpion announced today that Chimpion’s crypto e-commerce platform will support automatic stablecoin settlement to Gemini dollar (GUSD), which holds the distinction of being the world’s first regulated stablecoin. This functionality will allow merchants to receive payments in popular cryptocurrencies without needing to worry about market volatility. 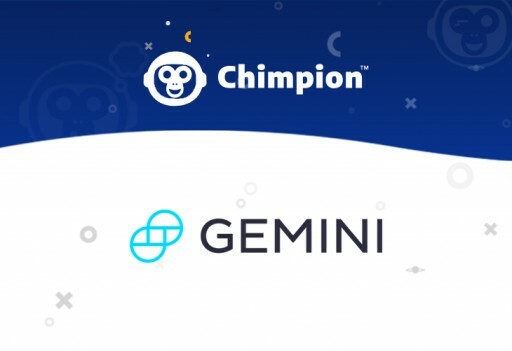 “We’re excited to see Chimpion’s adoption of the Gemini dollar. We believe the use cases for GUSD extend significantly beyond the traditional cryptocurrency markets and have the ability to transform payment processing, including e-commerce,” said Sarah Olsen, Head of Business Development for Gemini. Developed with the mission to create a blockchain-enabled economy, Chimpion empowers merchants of all sizes to adopt e-commerce through digital currency. Previously, volatility in the cryptocurrency market was a major barrier to its use for e-commerce. For example, the price of Bitcoin (BTC) rose from $10,000 in mid-November 2017 to over $19,000 just a month later, before diving below $10,000 again by February 2018. 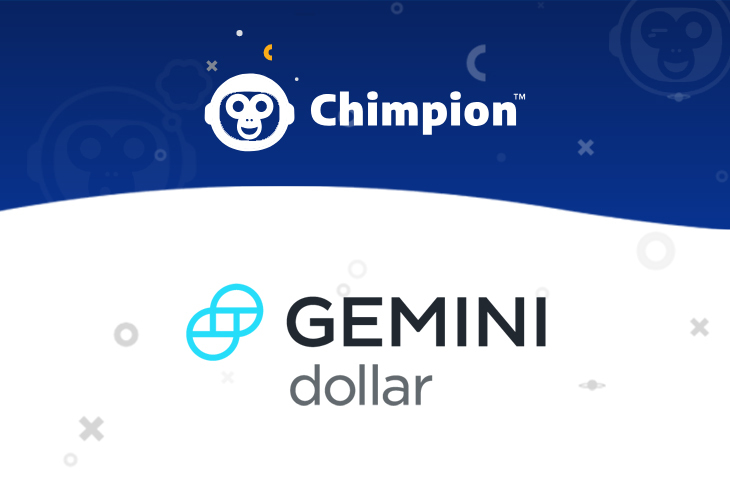 With Chimpion, merchants have the option to enable automatic conversion to stablecoins, which are cryptocurrencies backed by stable assets, allowing them to ensure that their assets are not affected by changing coin prices. Gemini dollar is approved by the New York State Department of Financial Services (NYDFS) and backed by US dollars held at the State Street Bank and Trust Company, the world’s largest custodian bank. By choosing automatic conversion to GUSD, merchants effectively reduce the risk of doing business in cryptocurrency to that of doing business in US dollars. Chimpion stores with this feature enabled will automate the process of converting payments received into GUSD, converting GUSD into fiat, and depositing into the merchant’s bank account in a process similar to credit card settlement. Shopping Cart Elite, which contributed the software for Chimpion’s crypto e-commerce platform, has recommended GUSD as a trustworthy, transparent stablecoin. The company has already launched several crypto-enabled stores with automatic stablecoin settlement, including Marks Jewelers, Mahone’s Wallpaper Shop, and Newparts. Chimpion is a cryptocurrency e-commerce platform that enables any merchant to begin accepting cryptocurrency payments online. 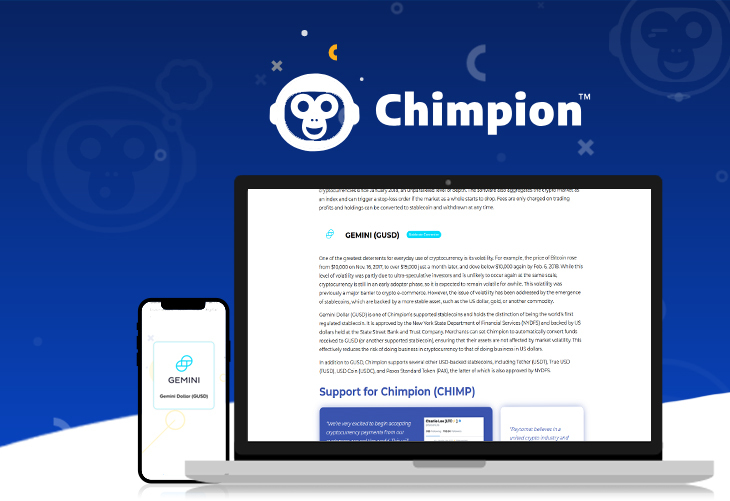 By holding Chimpion (CHIMP), merchants can gain access to Chimpion’s robust crypto e-commerce platform for free, without needing to pay a monthly subscription fee. 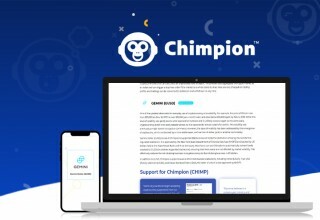 Chimpion was developed using technology from Shopping Cart Elite, Paytomat, and Bitcoin Diamond (BCD) and combines comprehensive e-commerce features with convenient payment processing. 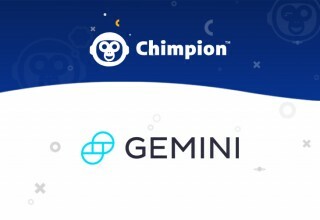 Chimpion’s primary goal is to drive the adoption of cryptocurrency as a payment solution by operating a rich e-commerce platform centered around digital assets. New startups and established merchants alike can become part of Chimpion’s vast network to take advantage of its fast and affordable transactions and user-friendly infrastructure.